After installing iODBC, proceed to install the PostgreSQL ODBC drivers. Verify the installation by confirming that the file psqlodbcw.so is in the /usr/local/lib directory. Next, you must register your new ODBC Driver. Open the iODBC Data Source Administrator application by either executing iodbcadm-gtk in the command-line, or by launching it from the Overview page of the MySQL Workbench Migration Wizard by clicking the Open ODBC Administrator button. 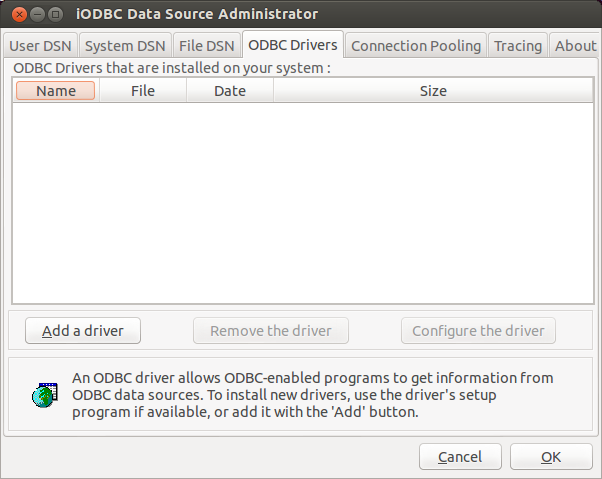 Go to the ODBC Drivers tab in the iODBC Data Source Administrator. It should look similar to the example in the figure that follows. And lastly, clicking OK will complete the psqlODBC driver registration.